Momentum may be building in Congress towards correcting a significant clerical error in the Tax Cuts and Jobs Act (TCJA). The error, known to some as the “retail glitch,” prevents investments in qualified improvement property (QIP) from qualifying for bonus depreciation. The correction would reduce the recovery period for QIP from 39 years to 15 years (20 years for ADS) making it eligible for 100 percent bonus depreciation! Senators Pat Toomey (R-PA) and Doug Jones (D-AL) introduced the Restoring Investment in Improvements Act while Representatives Jimmy Panetta (D-CA) and Jackie Walorski (R-IN) introduced similar legislation in the House. There appears to be broad bipartisan support of these efforts. The Joint Committee on Taxation has said the legislation would have no impact on the federal budget deficit. Various trade associations have been calling for the correction to be made, including the National Retail Federation, the National Restaurant Association, the Real Estate Roundtable, the Retail Industry Leaders Association, and the American Institute of Architects. Although these are positive first steps to making this technical correction, it is still uncertain as to when and whether this technical correction will be passed by Congress. Qualified Improvement Property is defined as any improvement to an interior portion of a building that is nonresidential real property as long as that improvement is placed in service after the building was first placed in service by any taxpayer (Section 168(k)(3)). QIP specifically excludes expenditures for (1) the enlargement of a building, (2) elevators or escalators, or (3) the internal structural framework of a building. KBKG Insight: Improvements to real estate may include items that are not eligible for QIP treatment. For example, HVAC components in a retail shopping center might include ductwork inside the building that’s eligible for QIP and package units on the roof that are not. When quantifying QIP, taxpayers should carefully evaluate their improvements to eliminate those elements that do not satisfy the QIP definition. Taxpayers that want to take full advantage of deducting the cost of capital improvements to real estate should take steps to segregate between interior vs exterior improvements as well as identifying excluded items. Contractors could provide additional cost details that would be useful in this analysis. Budgets and design plans could be reviewed to identify potential costs that should be excluded from QIP treatment. Cost segregation consultants can be engaged to assist with this analysis. 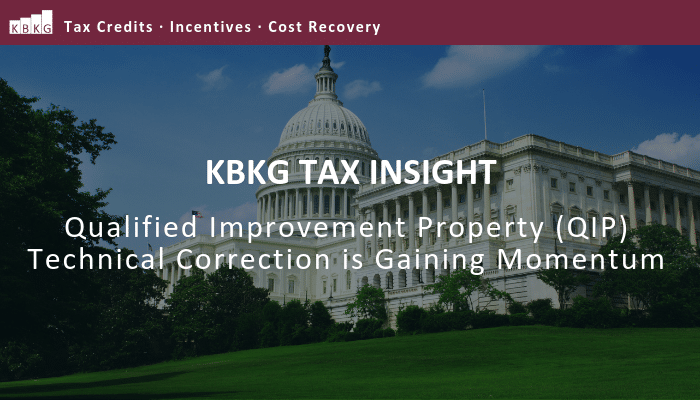 KBKG Insight: Although QIP placed in service in 2018 and beyond is currently not eligible for any bonus depreciation, eligible businesses may be able to expense QIP assets under Section 179. In the event that QIP is eligible for 100 percent bonus depreciation in the future, identifying assets that may be disposed of would not be necessary since affected assets would get an immediate write off. If you think you have construction costs that may be considered QIP that cannot be written off under Section 179, you should consider extending your tax return given that the tax code may change within the coming months. Contact a depreciation specialist to discuss options on how to maximize depreciation during this time of uncertainty. In the event the technical correction takes place; will it be retroactively to January 1, 2018? Our Regional Director, Michelle Vitale, will be reaching out shortly to assist you. Thank you so much for your comment. Have a great day! Thanks for your article that gives some business owners a ray of hope for tax year 2018. It mentions that the technical correction would have no impact on the budget deficit, and seems to have broad bipartisan support – just wonder why it’s taking so long. We have owners who are holding off filing extended 2018 tax returns pending resolution of this proposed technical correction. Hopefully their patience will be rewarded!